Greetings earthlings, from a planet out in space. I know I may still look human but I promise you I'm not. For a Halloween party I was not planning to dress up as anything, but my sister insisted I wear some sort of costume. Her suggestion was to dress in minty monochrome shades and go as an alien. 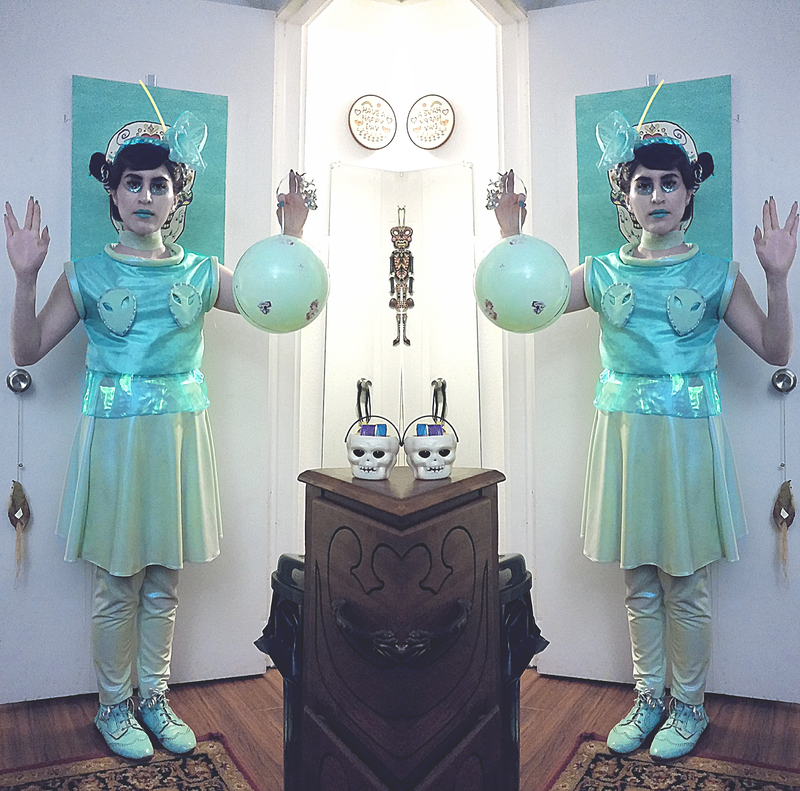 And so, at the last minute, I decided to be an alien space babe! As reference, I searched for "alien costumes" via Pinterest and came across an adorable pair of children's Homemade Alien Costumes that linked backed to Coolest Handmade Costumes. 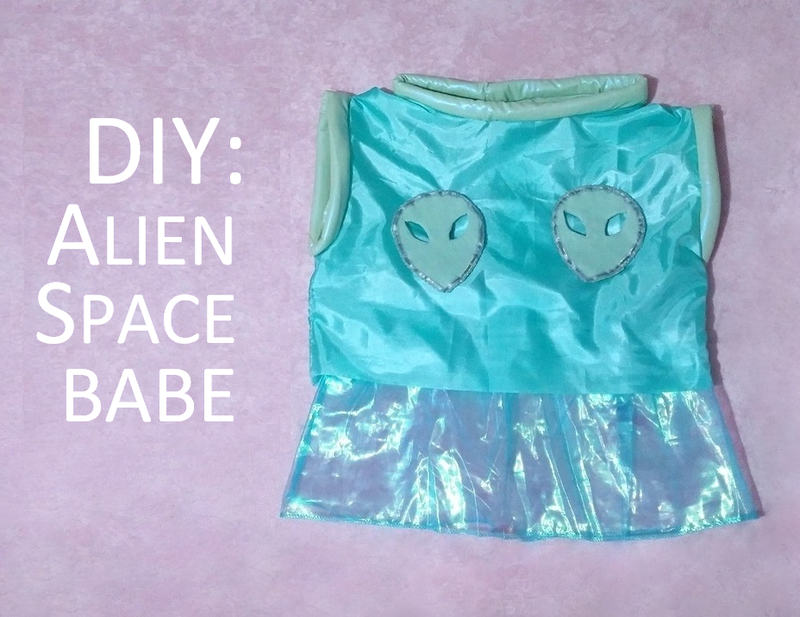 While another source of inspiration stems from Kiss Me Kill Me's darling "Aliens are Kawaii" top. Now my wardrobe is filled with minty garments so all I had to do was pair a few items from my closet. Just one thing... my minty green shirts are ordinarily human like, so I sprung into action by sewing a space cadet top. I rummaged through my fabric remnants and I cut out a basic top sewed it together then added cuffs to the arms and neckline. (Pressed for time, I had to omit the sleeves.) I had already made the alien appliques in lieu of World UFO Day, which I simply attached with a few strips of Velcro. As for the bottom half, I made over the summer. The leggings are McCall's Sewing Pattern M6173 and I pieced the skirt out of the remnants. As my accessories, I cut a strip of fabric scrap and wore it as a choker necklace. Then I added translucent fabric to a headband to make a sort of antenna like fascinator. For my hair and makeup, I had the help of my sister and generously added glitter all over myself. Lastly, I paired the look with my mint green Deery Brougue Ankle Boots by Golden Ponies. Plus an "Alien Manual" bible cover from Half Priced Books, where I actually like to safekeep my Lisa Frank notebooks and stickers. Initially I bought this particular ball for a DIY project (I ended up using another ball instead) so I made use of it as a replica of my "home planet" with tinsel and Lisa Frank stickers. Tada!! Another fun part at the party was that I brought along Lisa Frank stickers that I used to "tag" others with an "alien implant" by asking them to place somewhere inconspicuous. 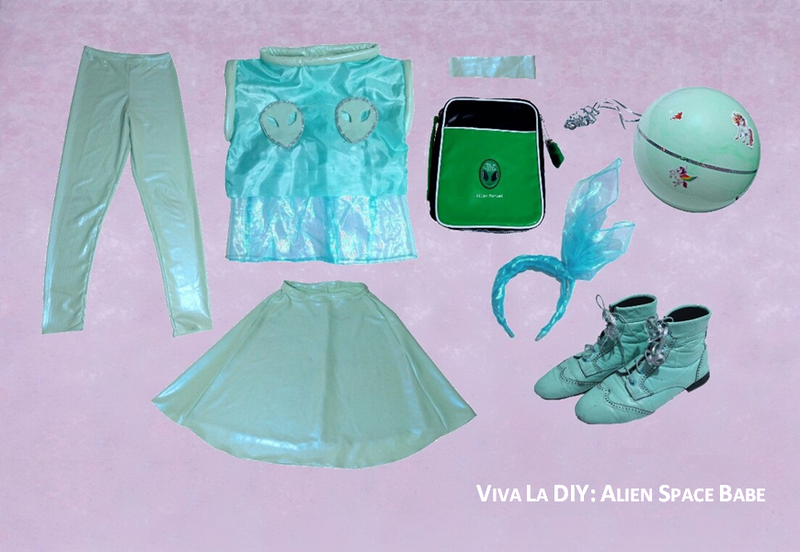 Alien Space Babe look complete. The method I used was improvised due to time constraints. Essentially, I use strips spandex remnant as the bias and rolled up scraps of fleece for the piping. Thanks, Marlena! I'm just surprised I managed to pull this off in so little time. Rhinestone choker toronto is now available online ust for you. Stride with style is providing it in fair price so that you can wear your demand.